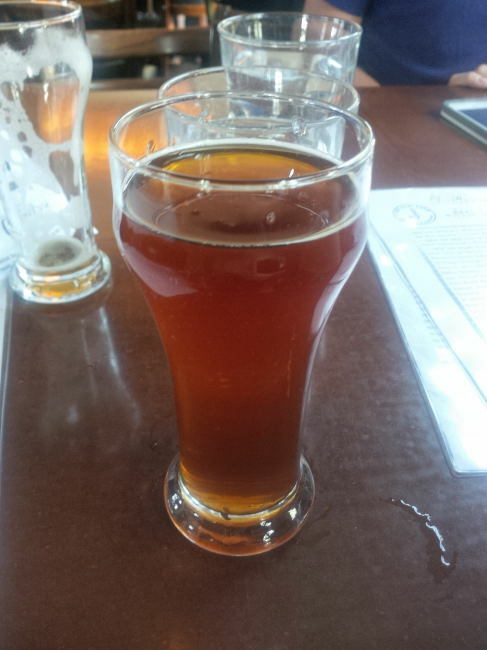 From Victoria BC’s Driftwood Brewing comes the “Bird Of Prey” a Flanders Red Ale. I was lucky enough to try this beer recently at the Alibi Room on August 20th 2013. I am not sure if this was a new batch of this beer or a keg coming from the 2011 batch but the original batch spent a full year in oak barrels. The beer pours a copper orange with basically no head. The aroma is of vinegar and fruits. The flavour consists of vinegar, fruits, malts and a good funkiness. The alcohol content may be 7.5% but there is nothing coming through at all. Commercial Description: The first in Driftwood’s Bird of Prey Wild Ale series, this sour ale was inspired by the Coopers Hawk that took residence in the brewery for a full 24 hours. Brewed in its honour, this wild ale spent a year in a mix of American and French oak wine barrels. Tart and funky, this beer can be aged a very long time, but is equally enjoyable now. This entry was posted in Barrel Aged, Flanders Red Ale and tagged bc, beer, bird of pray, canada, Driftwood, driftwood brewery, flanders red ale, fruit, fruits, funk, funkieness, funky, malt, malts, malty, victoria, vinegar. I would imagine its from the last batch, since I was just in there a few weeks ago and they said they didn’t have plans for a new Bird of Prey just yet. And it were available again, I’d be scouring the stores from here to Port McNeil! Well this was the first Bird of Prey not Belle Royale or anything. Yeah, which makes it odd that it would still be around, right? I was hoping they’d bring it back this year, but they were quite clear that with Belle Royale coming out this past Spring, they weren’t in any hurry. That’s ok with me. Just means I can drink more! Talking with a driftwood employee at the GCBF I was told that there were two kegs that did not go on oak back in the day. One was staff only and one went to the Alibi Room.